Its near neighbourhood to the port of Hartlepool produced in Hart an unenviable number of witches and women of immoral life. In 1454, ‘Helena de Inferno, alias morans in inferno, alias Meldrome,’ seems to have been as bad as her name implied. On 28 July 1582, Alison Lawe of Hart was prosecuted for being ‘a notorious sorcerer and enchanter.’ Two women of the neighbourhood had consulted her and asked her for cures for the sick. Fortunately this was before the outbreak of the witch superstition in the 17th century, and Alison was condemned only to stand with a paper on her head once in Durham market, once in Hart Church and once in Norton Church. She was peacefully buried at Hart six years later on 5 August 1588. In 1596, Ellen Thompson ‘fornicatrix and excommunicated’ ‘was buried of ye people in ye chaer at ye entrance unto ye yeate or stile of ye church-yard on ye East thereof.’ On 12 February 1641, Old Mother Midnight of Elwick was buried, but it does not appear how she earned her name. It is believed that the three latter, ‘confirmed’ witches are buried over the sty from Hart Cemetery so that locals could regularly walk over their graves in unconsecrated ground on their way to and from church. This would ensure that they would be kept well-and-truly trodden underfoot. Catherine Howard, fifth wife of Henry VIII, is thought to have been born in Wingate, Co.Durham – probably, one can safely assume, in the little hamlet now known as ‘Old Wingate’ a little to the west of the coalmining creation that is the modern-day Wingate. Admittedly, Catherine’s exact date and place of birth have never been proved beyond doubt. Even the year of the event itself has been given variously as anywhere between 1518 and 1524. She was the daughter of Lord Edmund Howard and Joyce Culpeper, and was technically a commoner. 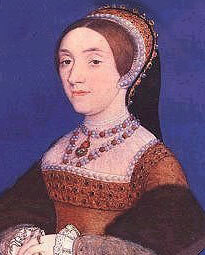 A very young Catherine married an ageing Henry in the summer of 1540 at Oatlands Palace in Surrey. The young woman was soon in trouble with the powers-that-be. Rumours began circulating almost immediately of her infidelities – especially with courtier Thomas Culpeper. Proof was slowly collected by dubious means, it being necessary, eventually, to manufacture a new law (actually, a bill of attainder) which made it treason, and punishable by death, for a queen consort to fail to disclose her sexual history to the king within twenty days of their marriage, or to incite someone to commit adultery with her. In February 1542 – within two years of her marriage – she was sent to her grave by way of a single blow of the executioner’s axe. She may not even have been out of her teens. The Castle Eden Beaker, now housed at the British Museum, is a classic example of what is commonly known as a ‘claw beaker’ – for obvious reasons – and is a remarkable survival of the early years of Anglo-Saxon England. This exquisite relic measures approximately 19cm in height by 9.5cm in diameter. Dated to the late 5th century AD and of Frankish origin, it was unearthed under a hedge near to St.James Church, Castle Eden, a little to the south of Peterlee, in 1775. The area, at the time being worked upon by local landowner, Rowland Burdon (the church had been built only a few years previously), was found by a humble estate worker. The base of the item was protruding out of the ground when found. The piece must have been imported in the decades after the Roman legions left these shores – perhaps as a possession of its migrant continental owner – and was carefully buried as the sole grave good alongside its human partner as part of an elaborate ceremony. It must have been a highly treasured possession. 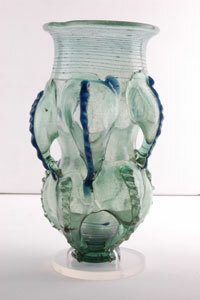 The item is made of pale greenish-blue glass with blue trails. Both body and claws are all ‘blown’, with the latter having been applied to the cooled body as a lump of glass which was then blown into shape through the wall, drawn out and reattached to the body. After its discovery, it was passed down through various families and individuals, until it arrived, still intact, at the British Museum in 1947. It is the only one of its kind to be found in England. Blackhall Beach. The wasted shore, the aerial flight. And Jack Carter finally gets his revenge in the climactic scene of the classic 1971 gangster flick, Get Carter. Today, faint traces of former days of industry can be made out as per the above image, with the line of the aerial flight still discernible by way of the concrete channel running across the foreground. The overhead conveyor once carried coal waste from nearby Blackhall Colliery over and out to sea – and provided Michael Caine with a handy means of disposing of the body of his final on-screen kill forty years ago. The black beach and its coaly waves are beginning to disappear, too, thankfully – though one can’t quite yet call it pretty. More excellent ‘then and now’ shots here (and use the ‘back’ and ‘next’ button for more). Founded in 1948, the County Durham town of Peterlee is named after the famed miners’ leader of the same name, that is, Peter Lee. But who was this man who had the unusual distinction of having a brand new settlement bear his name? Lee was born in 1864 in Trimdon Grange, in the delightfully-named Duff Heap Row. He was one of eight children and, naturally, found himself thrown down the Durham pits from an early age. By the time he was 21 he had worked at 15 different collieries. Despite having little schooling, his mother’s love of reading gave Lee a lifelong drive towards self-education – though he didn’t learn to read and write until his early 20s. Seeking wider horizons, he emigrated to the USA in 1886, where he worked the mines of Ohio, Pennsylvania and Kentucky. 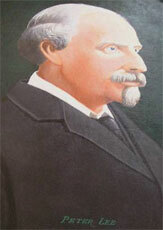 He returned to County Durham in 1888, and became a delegate to the Miners’ Conference for Wingate Pit. He married, too, in 1888, and continued to develop his various interests and career for the next few years. A trip to South Africa in 1896 proved a turning point in his life. He became a born-again Christian and, on his return to his homeland, added Methodist preaching to his spare-time obsessions. From 1900, he found himself working at Wheatley Hill as a checkweighman, and moved onto the parish council – eventually becoming its chairman. He was now responsible for much of the necessities of everyday life: sanitation, new roads, cemeteries, etc. ; and as chairman, too, of the local Co-operative, he was becoming highly influential in local affairs. He was elected chairman of the Durham County Water Board, then joined the County Council itself in 1909 – eventually becoming its chairman in 1919 (England's first Labour county council). In the meantime, he continued to campaign vigourously for improvements to the welfare of miners, rising through the ranks of, firstly, local organisations, then the Miners’ Federation of Great Britain (the forerunner of the National Union of Mineworkers) – becoming its president in 1932. He died in 1935, having very much established himself as a local hero, and was interred in Wheatley Hill Cemetery. What does a historian make of a project designed to wipe all traces of industrial activity from a stretch of coastline in an attempt to revert it to its former, natural beauty? In the case of the Durham Heritage Coast, as it is now called, surely no one can complain. For as recently as the early 1990s, the East Durham seaboard was an industrial wasteland, made famous by distinctly unglamorous appearances in such films as Get Carter and Alien 3. A century of coal mining activity had scarred the coast beyond recognition, waste-dumping from the scattering of collieries betwix the Tyne and the Tees placing the beaches in some areas beneath ten metres of black slag and poisoning the water and its natural habitat for several miles out to sea. Flora and fauna were devastated. Come the closure of the pits in the years leading up to the early 1990s, locals had long since turned their backs on the disgusting mess and cared little for nature’s woes in the face of their own collective economic plight. The mid-‘90s saw a sea-change, though. With the availability of Lottery Fund cash, the local authorities rallied, and, with the help of a host of other organisations and vested interests, launched the ‘Turning The Tide’ (TTT) project in 1997 – and the clearance work began. 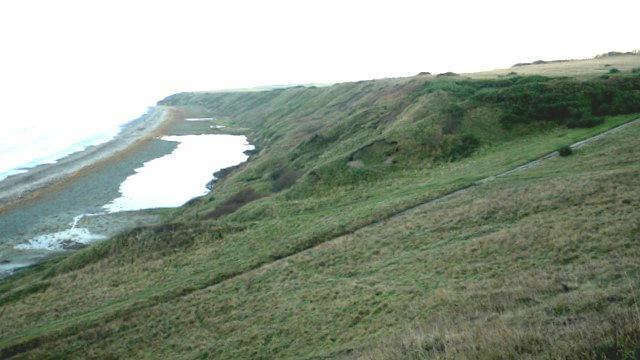 Astonishingly, within its five-year remit, TTT had utterly transformed the landscape: by 2002 the coastline was well on its way to an incredible recovery – a process now being continued by local groups, the Durham Heritage Coast Partnership and nature itself. Today there are 15 miles of new coastal footpaths and more than 30 miles of cycleways criss-crossing a unique magnesian limestone landscape which is home to all manner of rare and beautiful plants, insects and animals – all suitably protected by law and freed from farming use. For once, the wiping of our historic past has been welcomed by one and all – though it lives in on a scattering of information panels the length of the coastline. The video, here, says and shows it all. 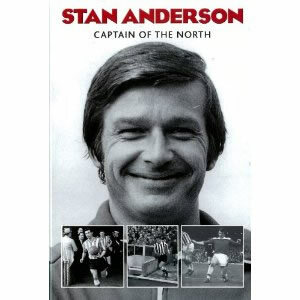 Ex-professional footballer Stan Anderson published an autobiography in 2010 entitled Captain of the North (see here). Never can a book have borne a more appropriate title: for the man in question is the only individual, ever, to have captained each of the region’s ‘Big Three’ football clubs – Sunderland, Newcastle and Middlesbrough. Stan was a cultured, whole-hearted midfielder with an eye for goal; considered to be ahead of his time by many in the way he played and thought about the game. Anderson was born on 27th February 1934* in Horden, Co.Durham. After turning out for the colliery’s team as a teenager whilst learning plastering and plumbing, he eventually signed professional forms for Sunderland in 1951 and made over 400 appearances for the red and whites – gaining two England caps in 1962 and forming part of his country’s 1962 World Cup squad. In 1963, he moved to rivals Newcastle United, where he stayed for two years, steering them to promotion in 1965. He then signed for Middlesbrough as player-coach, then became manager during 1966-73 (amazingly, he had been rejected by the Teesside club whilst playing for Horden Colliery). Thereafter, he had spells as a manager at AEK Athens, QPR, Donaster Rovers and Bolton Wanderers, before retiring to care for his wife in 1981. He is now into his late 70s and lives in Doncaster. * Strangely, his exact date of birth varies between sources – 27th February 1933 and 12th December 1933 are also given. If you’re reading this, Stan, do put me straight! Well, sort of, anyway. The so-called ‘Yoden Village’, still shown on most modern-day maps a little to the north of Peterlee, certainly existed – but it was never known as Yoden, so far as recent historical research has been able to ascertain. The origins of this curious little settlement have long been in dispute, with initial, erroneous, assumptions setting its roots in the pre-Conquest era. Simeon of Durham, writing in the early 1100s, was long thought to be referring to the site with his ‘Ioden’ and ‘Geodene’ place-names, but these are now thought to refer to ‘Eden’ to the south of Peterlee. Nineteenth century antiquarian, Robert Surtees, seems to have invented (or reinforced) the myth by ascribing the term ‘Yoden’ to the site in the pre-Victorian era. ‘Yoden’ doesn’t even appear on OS maps until the back end of the nineteenth century – prior to this (and especially prior to Surtees), the place seems to have been unnamed. Scholars, it seems, were complicating the matter quite unnecessarily. Current theories identify the ‘deserted medieval village’ in question simply as that of ‘medieval Horden’. Modern-day Horden lies about a mile to the east, of course, so it makes sense. Moreover, it lasted for just a century: from around 1335 to 1431, after which quarrying overtook the site (with any earlier, ‘Anglo-Saxon’ village more likely to have been around Horden Hall to the north). It probably consisted of no more than two rows of eight crofts in total. For detailed speculation, maps, and the like, see here.